Independence Day: Resurgence is now showing in cinemas everywhere and is distributed in Australia by 20th Century Fox. "We had twenty years to prepare. So did they"
So reads the tagline of Independence Day: Resurgence. Likewise, Roland Emmerich has had twenty years to prepare sequel to the fun, entertaining and thrilling Independence Day, but in all the excitement he has forgotten to correct what was wrong with the former. 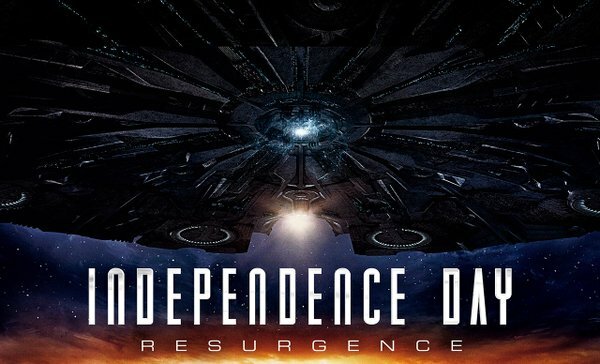 Instead, what was wrong with Independence Day is what is wrong with Independence Day: Resurgence...and that is only the beginning of it's flaws. In an alternate world where aliens did invade Earth in 1996, 2016 looks a great deal like the futuristic world as depicted in "The Jetsons" and Disneyland's Tomorrowland. 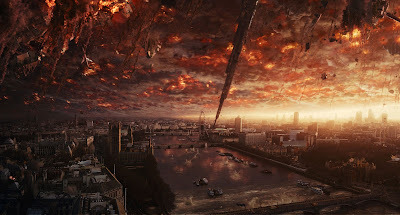 The invasion left Earth knowing a great deal more about the other life forms in our universe, but the other life forms learnt enough about our strengths and weaknesses to have another go at taking over the planet. They return to Earth with a force greater than any we have ever seen causing destruction on a grander scale than before. In other words, exactly the plot we were expecting this sequel to have. Same story, same enemies...just on a larger basis. 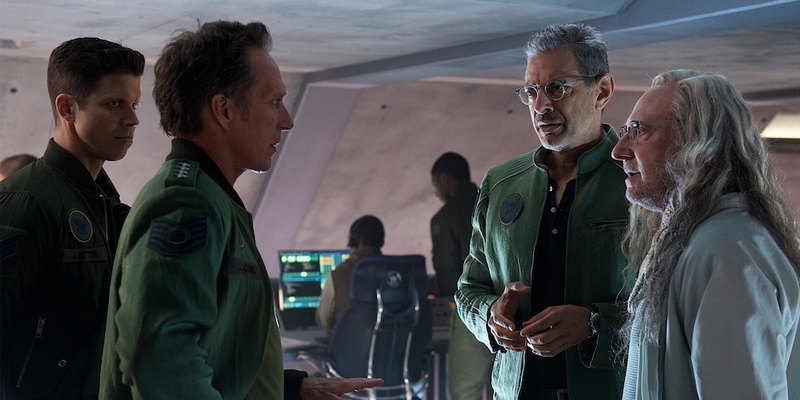 Independence Day: Resurgence's timing is only part of it's problem. Of course twenty years is an incredibly long time between movies and it can hardly be a surprise that ticket sales are not as spectacular as they would have liked. Independence Day fit right into 1996 when the disaster film fad was gaining momentum and an interest in the paranormal and aliens was at an all time high thanks to the hugely popular "The X Files". In 2016, the disaster film genre is tired and although there will always be an interest in whether we are alone in the universe, there is not much different that can be done with this concept in film. Despite the screenplay being rather ridiculous at times and having some atrocious dialogue, Independence Day: Resurgence is still watchable and even surprisingly fun. It is a matter of everything being so exaggerated that makes the film actually quite funny. In reprising his role of now ex-President Thomas Whitmore, Bill Pullman gives an over-the-top patriotic speech that is supposed to be reminiscent of his infamous speech in the first film, but is almost cringe-worthy in how comical it feels. The action sequences are rather enjoyable and this is one aspect that the sequel being made in 2016 has benefit from as CGI has come a very long way since 1996. Like it's predecessor, Roland Emmerich's second venture with this July 4 franchise doesn't have a small cast. However, one of the things that did make the first film successful was how much emotion the viewer was exposed to regardless of how many characters there were. Now it is the opposite. None of the characters have enough time to make the viewer feel anything for them, but there is undoubtedly a great deal of opportunity to make this happen with loss and love taking place all through the film. One thing that Independence Day was criticised for (especially in Film Studies classes across the USA) was it's attitude towards women. The male characters were solely responsible for saving the world and the women either waited at home for the men to arrive or were killed off. It is as if Emmerich was aware of this criticism and really did attempt to rectify this, but with the exception of one or two characters still gets it wrong. At the beginning of the film, it looks extremely promising for women with the current President being a woman, once stripper Jasmine Hiller (Vivica A. Fox) is now in the medical profession, Patricia Whitmore (Maika Monroe) is a trained fighter pilot and one of the first people on an African base to investigate is Dr Catherine Marceaux (Charlote Gaisbourg). However, President Elizabeth Lanford and Jasmine do not reach a desirable fate, Patricia's fate is decided by a man and Dr Catherine Marceaux doesn't really do anything of any great merit in the whole film. The only female character who has any success without being supported by a man is military pilot, Rain Lao (Angelababy). The question still hangs in the air as to why Mae Whitman, who played Patricia Whitmore as a seven year old in Independence Day was not recast in the role. Truth be told that Whitman (who is still a popular working actress) and Monroe are very different types of actresses and many are jumping to the conclusion that it was based on her looks that she was not recast. The role of Patricia Whitemore would have indeed been extremely different had Whitman been called on to reprise her role, but it would have been far more interesting if that was the case. However, Ross Bagley who played Dylan Hiller in 1996 was also not called upon to reprise his role. The best performance in the film is by Joey King, who doesn't have anywhere near enough screen time. King plays Sam, a young girl who has had the responsibility of her three younger siblings thrust upon her since the recent disappearance of their parents. Despite her limited time in the film, she is the only one who completely captures the raw emotion of her overwhelming situation. She is struggling with the assumed death of her parents and not only taking on the parental role in her family, but becoming an adult literally overnight. She is the only character who you actually feel anything for and empathise with. Despite his dorky patriotic speech, Bill Pullman is also fine enough. 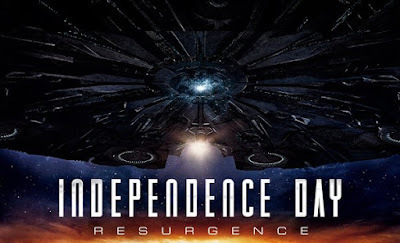 Independence Day: Resurgence is a deeply flawed film that is one of those sequels that never needed to be made. Yet, it is just the right amount of corny and impressive thrills to make it an entertaining blockbuster.